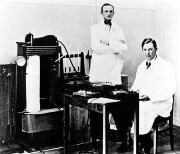 Swedish inventors Baltzar von Platen and Carl Munters were both students attending the Royal Institute of Technology in Stockholm, Sweden. They joined forces to create a simple absorption refrigeration machine that could be used in the home. The two rented a room together, worked long hours, and often missed classes. The duo began their design, basing it on the cooling principles discovered by French scientist, Ferdinand CarrÃ©, and adapted it with a 3-fluid configuration. Their absorption refrigerator required no moving parts and only a heat source to operate. The "Platen-Munters" refrigerator design was eventually picked up by AB Arctic (a company soon bought by Electrolux) and put into mass-production in 1923. In 1926, Albert Einstein adopted the "Platen-Munters" design for his own alternative version, the "Einstein Refrigerator". During his career, Baltzar von Platen worked with Swedenâ€™s primary electrical company, Asea. With them, he worked on a process that used heat and pressure to produce synthetic diamonds. Carl Munters continued to invent, filing over a thousand patents by the time of his death. His other creations include foam plastic, insulation materials, and various air conditioning and dehumidification techniques. After his death in 1989, the Munters company became an international group, specializing in humidification technology.